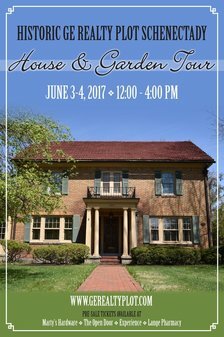 The GE Realty Plot House & Garden Tour returns this June 3 and 4. Tickets are $25 -- they're available online (and a few retail spots listed at the first link). The tour is offered every other year in the Schenectady neighborhood just east of Union College. General Electric bought it at the end of the 1800s and it was subdivided as a neighborhood for company executives. The design of the neighborhood was inspired by New York's Central Park. This year's tour includes six homes. A listing is after the jump. All blurbage via the tour website. Colonial Revival home using atypical materials such as orange brick and a tile roof. This home combines Dutch Colonial sensibilities with Queen Anne accents. Entrancing half-timbering reflects the home's Tudor Revival status, blended with Queen Anne adornments. Luxurious American Queen Anne style home, with stunning Federal, Georgian and Richardsonian motifs. This home is classic Queen Anne style. It is exquisitely shingled and boasts intricately patterned rock masonry on its foundation. A reminder the annual Hidden City House & Garden Tour in Albany is June 22.